Kit includes: security slot adapter plate, Kensington lock, set of (2) keys, super strength adhesive. Security slot adapter is discreet so it does not detract from the appearance of equipment it is mounted on. 6ft. Cable allows users to secure to an immobile structure. Adhesive permanently attaches platic adapter to wood, rubber, plastics, metal, paper, and leather. See video below for step by step instructions! This cable lock adapter kit comes with extra-strength adhesive that allows the included plate to attach easily to many different devices. 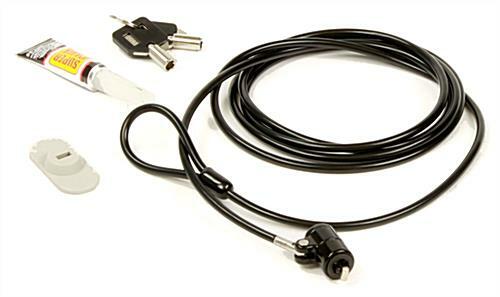 Each loss prevention accessory helps secure expensive retail store or business equipment using the six foot long theft-resistant wire cord and included set of two keys. 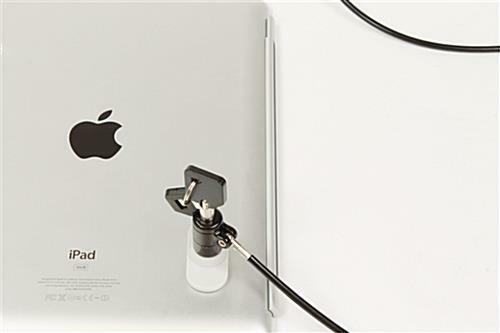 This discreet lock adapter kit enables is a great way for commercial operations to protect expensive electronics. 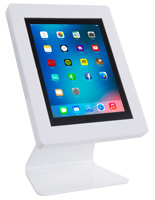 A set of 2 keys is provided for access control in retail stores and high traffic environments. 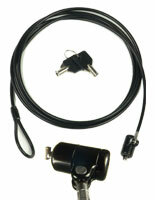 The adapter kit comes with a six foot long plastic-wrapped wire that tethers devices using the included plate. Use the included extra-strength super adhesive to firmly attach electronics as needed. This simple locking accessory is a perfect addition to any facility or business loss prevention program.